Learning games for kids that are really fun! Really FUN learning games for kids that YOU BOTH can enjoy. Great toddler games ideas for little or completely "FREE" These preschool activities are reallt great for teaching toddlers. So if your toddler is driving you crazy then there's lot of really fantastic toddler games for you both to try here. This is a simple game that get your toddler thinking about how different things feel. Different textures to the touch and how they handle when touched. The aim of the game is to put their hand in to each box without looking in and then guess what's in each box in turn. You ask them to feel in the red box or the green box. So they are having to think about colors as well as what they are feeling. 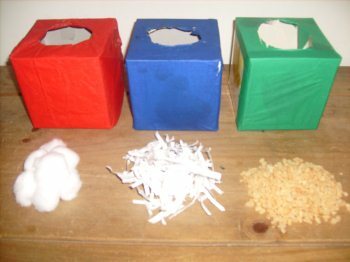 You will need 3 empty tissue boxes or similar that you cover with different colored tissue paper. Your little one can help with this as it is all stuck on with a kids glue stick. Next cut some squares out of the tissue paper the size of the front and top of the box. You don't need to cover all the sides. Then cut out the whole on the top. You can put almost anything in the boxes for them to feel and quess at. In the photo here we used cotton wool, Shredded paper and rice crispie cereal. You can play this learning game for kids with different things everytime or keep adding old stuff that your toddler struggles to identify. These kids card games are another great idea for helping toddlers to learn some simple shapes. To see if very young toddlers understand matching shapes print out 2 copies. Then cut out the shapes from one print out. Then place the uncut sheet in front of your toddler then give them the cut outs and ask them to put the right shape on top of each other. Again this is a very simple way of getting them to understand that there are different shapes even if they don't yet know the shape names. To get your free printables click on any image below. Yet another of those old traditional favorite toddler learning activities that can keep toddlers amused for hours. 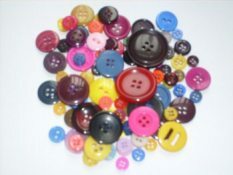 As you can see the learning games for kids possibilities with buttons are endless. Just a word of caution with buttons NEVER leave them unattended while playing with buttons as they may swallow one and choke.